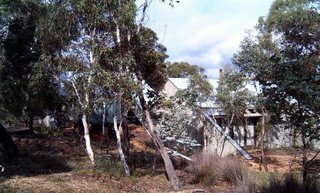 Out Of The Blue: 'Edge' - Judith Wright's Braidwood home. Readers may be interested in Judith Wright's property 'Edge' at Braidwood. Below is a photo taken when Meredith McKinney took a walk through the grounds at the 'Two Fires Festival' in 2005. It is now in private hands but I am told they are friendly. A link to more images ... 'Edge' - at Braidwood.